Paan Singh Tomar is the true epic journey of a talented runner who turned into rebel.lt is directed by Tigmanshu Dhulia, and produced by Ronnie Screwala. 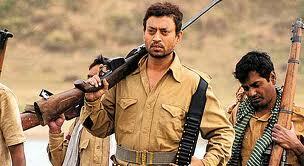 A reporter interviews Paan Singh Tomar (Irrfan), a dacoit who is in the news for killing 9 people of a community. Answering questions about himself, the story goes in a flashback in year 1950. Paan Singh works in the Army while his (wife and mother) live in Morena. He surprises his seniors in the Army with his athletic skills. Though he was not interested in sports, he joins the sports division because there was no limit on diet. Picked for the 5000 meters race's training, he was persuaded to run for the 3000 meter steeplechase by his coach. He participates in the Indian National Games and wins the gold medal in the steeplechase event 7 years in a row. In 1958 he participates in the Asian Games at Tokyo, but couldn't win because of inability to adjust with the Spikes given to him in the final event only. He feels frustrated when not allowed to go the borders in 1962 and 1965 war because sportsmen were not allowed to fight in the wars. In 1967, he participated in the International Military Games and wins the gold medal in the steeplechase. His elder brother from his native place visits him and tells about illegal acquisition by Bhanwar Singh, his relative. Paan Singh retires from the Army to settle his family disputes, despite being offered a position as the coach in the army. On arriving home, he tries to resolve issue with Bhanwar Singh. He seeks help from the District Collector and local police station, but no help is provided. His son gets beaten badly by Bhanwar Singh and his goons. Paan Singh then orders his son to rejoin army and stay away from the dispute. Bhanwar Singh and his goons try to kill Paan Singh and family. His family manages to escape but his mother gets killed brutally. Paan Singh decides to avenge his mother's death. He becomes a baaghi who wreaks havoc in the Chambal Valley. He forms a gang and continues to add new members. He starts kidnapping people for financial support.He uses Police dress and police vehicles.He soon becomes notorious in Chambal Valley area. After gaining enough power and money, he murders Bhanwar Singh and his goons. One day, Paan Singh and his gang stay in a village. The village sarpanch informs police about Paan Singh's gang. The police attacks the compound where Paan Singh is staying. Paan Singh manages to escape, but his elder brother is killed. To avenge his brother's death, he kills the sarpanch and 8 other people. The interview with the reporter ends here and the interview is published in the newspaper and causes a sensation. The police continues in its search for Paan Singh Tomar, who decides to lay low for a while. He meets his family and his coach in the army who requests him to surrender. Paan Singh refuses to surrender on the principle that while he was a sportsman holding a national record, nobody came to help him with his problems, and the moment he turned a rebel, everyone wants him to be arrested. When the gang reconvenes after a month's hiatus, one of the members who had turned a police informer betrays the gang and gives them away to the police. A shootout ensues where all members of the gang, including Paan Singh are killed.